The New York Yankees aren't so hot, but at least Derek Jeter has a cool baseball video game. Pull out your phone and swing for the fences with Derek Jeter Pro Baseball 2008. Gameloft's latest sports offering merges America's pastime with easy to learn controls and slick looking graphics, making it a great pick up and play game for when you want to squeeze in a few innings between class and work. 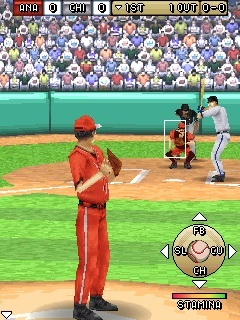 For the most part, the game plays similar to its predecessors, with you swinging the bat with the five key (or Home button) and pressing corresponding buttons to pitch. What's here works very well, as Gameloft continues to perfect its formula. Games are heated affairs where you attempt to outsmart the opposition buy smashing the ball out of the park or bunting with the 1 key. Pitching is cool, as you can select where you want to throw and the types of pitches. In addition, the game will auto field for you, and this is a godsend, since maneuvering those little players around the field is a chore, thanks to cramped keypads, though you can turn it to Manual if you so desire. What amazes us about this game, aside from how much fun it is, are the wealth of options. You have four difficulty levels (Beginner, Rookie, Pro and All-Star), long and short games (one, three, six and nine innings), three game types (evening, night and real-time), the ability to change your lineup, the option of subbing pitchers and hitters, a 58 game season mode and Derek's Derby, which is nothing more than Homerun Derby. Sure, none of this stuff compares to console baseball games, which have tons of features, but it's sweet how the developers crammed so much into a cell phone game, especially one with 3-D graphics that look great, not beyond PSOne quality, but amazing given the platform. Keep in mind, however, that if you have a less powerful phone, you'll play with 2-D sprites. If you need a fun baseball game with well-designed controls, look no further than Derek Jeter Pro Baseball 2008. It's without question one of the best cell phone sports games on the market, and the perfect one to play while watching the Yankees lose. What's Hot: Easy to learn controls, great audio, attractive visuals and lots of options. What's Not: Derek's Derby is just Homerun Derby. Yawn.